It may not have been a day at the races, but Tommi Clark's win-place-show stranglehold on the $2,500 USHJA Hunter Derby certainly brought some excitement to the LAEC Opener Horse Show (Jan 18-20). Though she is no stranger to the winner’s circle, finishing in the top three spots was quite a feat for the young professional. "I am so lucky to have all these great horses that performed their best," Tommi commented. "We really just went in and had fun." Randy Henry, a seasoned judge of almost 30 years, judged the class. "I really enjoy what course designer Meghan Rawlins (Victoria, British Columbia) puts up. It's fair and offers enough questions that it should separate the horses. I always look for flow, logic, and what will show off athletic ability and movement." Tommi pointed out, "They did a great job of changing up the courses and making them interesting. I liked ending at the far end of the arena in the first course." Tommi not only knows how to get around a hunter course, but she is studying to design them with Joe Lombardo and Linda Allen. At the end of the first round, Alexandra Murray and her Otis emerged at the top of the pack with a score of 88, while Tommi and Harper (Bailey Gossett, owner) were just behind her with 86. Fifteen horses returned for the handy round, which challenged the riders to take the tighter turns and show off their horses. This course distinguished the top horses and riders from the start as it began with a tight rollback from fence one to two. Riders then negotiated a trot fence followed by a rollback option either to the left or to the right. An unfortunate mishap left Alexandra out of the standings in the second round. Tommi and Harper advanced to a well-deserved first place, while her own Kampari placed second and Exemplar (Stephen Borders, owner) was third. "Harper has been in training with me for about four years and has derby experience, but today he jumped better than he has ever jumped, and I’m lucky to have such a brave horse in Kampari," Tommi enumerated. "Exemplar has only been training with me for a few months, but he is already showing amazing potential." Lauren Franco was thrilled to place second in the handy round and fourth overall on her Ben 'CZ, but she was even more excited to win the CPHA Foundation Medal in her first win as an amateur. "My trainers at Elvenstar have helped me prepare for medal classes," Lauren shared. "We practice work off tests in the warm up ring, so I felt ready. The first rollback was really tight and surprised my horse, but then we got really smooth. I think I chose a good track to hand gallop." Lauren hopes to qualify for all of the amateur medal finals this year. Sierra Swaffar (Shauna Pennell, trainer) received the second place ribbon aboard her SS Brando, plus she won the LEGIS Jumper Medal Class. "I have had Brando for a little over a year. 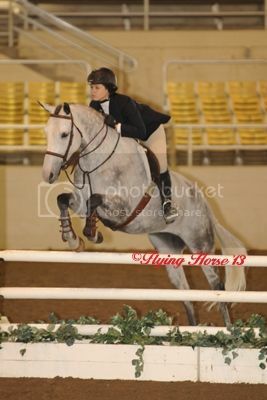 He really helps me in the equitation ring because he can make very handy turns," Sierra said. She is currently a senior at Foothill Technology High, but hopes to take a gap year before college so she can compete in the 3'6" medal finals as a junior. She noted, "Shauna really pushes me to reach my full potential and doesn't expect greatness, just my personal best. Brando jumps everything and helps me feel confident." Riders of all levels enjoyed competing in the new LEGIS Medal Classes, where riders do not have to pay a membership fee to participate in the LEGIS League in 2013 and they are qualifying for the LEGIS League Finals in November. Morgan Shayler (Heidi Misrahy, trainer) took home the blue ribbon for the LEGIS National Children’s Medal Class on Prince Caspian (Chelsea Pennington, owner). "The test was trotting a vertical, and I was a little apprehensive," Morgan shared. "But we nailed it. It was great." 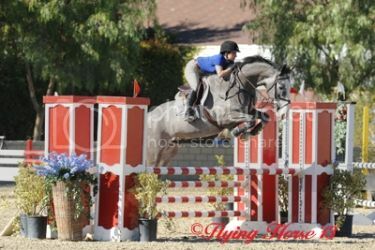 She also competed on Santana (Betty Meyer, owner) in the jumpers. 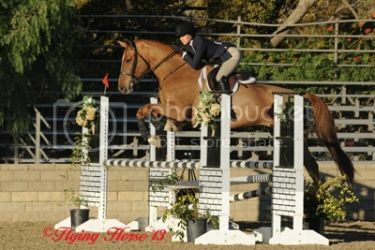 "I love having a dedicated jumper and a dedicated hunter. I am a newcomer to the jumper world. I had such a fun weekend overall." Morgan’s barn mate Katie Russell (Heidi Misrahy, trainer) has been an equestrian since age three and earned the Short/Long/Rusty Stirrup Championship and Green Rider Reserve Championship on Versace (Katie Russell, owner). "I've been showing Arabians, so I'm brand new to the hunter/jumper world," she revealed. "I started last year with Heidi and I’ve only had my horse for five months. I was thrilled to get through all my courses and win some classes. Versace really takes care of me because he's very experienced and tolerant. Heidi is so encouraging and patient and always points out small details." Katie loves coming out to the Langer Equestrian Group shows. "I think they do the best job and everyone is so friendly." A sense of camaraderie among Heidi's students was abundant as barn friends enjoyed a fun weekend together. Bella Hadid (Kost Karazissis, trainer) and her Night Cap had quite the triumphant weekend with a win in both the ASPCA Horsemanship Medal Class and the Pessoa/USEF Hunter Seat Medal Class and a second place in the USEF Show Jumping Talent Search. They were also reserve champion in Equitation, 16 thru 17. "Night Cap and I have been together for two years," Bella shared. "He has a big personality and wonderful form." The pair got a head start on points for the year, but Bella knows showing isn’t just about the points. "My barn mates and I always have a lot of fun and we are like a huge family," she said. Trainer Karen Perlow had a successful weekend as well, debuting several green horses and new partnerships. "My business has grown quite a bit and we have many new young horses and clients this year," Karen explained. "This is a great show to start off the year because it’s close to home, the rings are inviting, and young horses and riders are able to school in the show ring. Many of my clients are campaigning for year end points, so this provides good experience for them and a solid foundation for the year." Karen’s student Alexandra Vizents started the year off right on Amarillis Van De Kaai (Mcdongh School, owner). "I just recently started leasing her," Alexandra stated. "This is our first big show together and our first time competing in the Low Children’s Jumpers." The pair didn’t miss a beat and were Low Children’s/Adult Amateur Jumpers Champion. Karen was thrilled to be co-champion in the 0.95M Jumpers on her Suganda, a horse which has had a long road back to the show ring. "Four years ago, Suganda was in a horrific trailer accident and had to have major surgery," Karen explained. "I was told she would never be rideable again and that her best future would be as a broodmare. It was amazing to feel how much power she had in the show ring this weekend after being told she would never jump again. She had so much fun and jumped great on the Olympic mix footing. 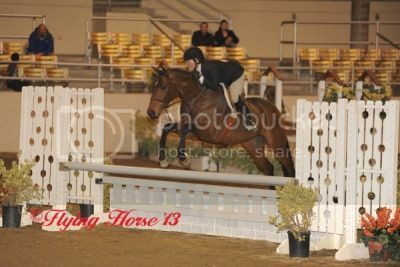 I’m so proud of her and that we were able to heal her and bring her back to the show ring. This is finally her year to campaign in the jumpers." In addition, Karen was champion in the 3' Pre-Green Hunters on Deep South (Sue Lane, owner), and her student Eli Bussel was reserve champion in the Medium Pony Hunters on his Summerhill. "It was a really a great show and we’re looking forward to coming back and showing at the LEG shows at Los Angeles Equestrian Center throughout the year," Karen said. Overall, the weekend an all-out success for both trainers and riders as they picked up points and prepared for a successful show year. The next show at LAEC will be Gold Coast 1 (February 15-17). Also in Southern California, the Verdugo Hills series of shows will kick off Mar 2-3. In Northern California, things will get under way with the Woodside Spring Preview (Apr 25-28), while the Colorado show season starts next weekend in its new location with Colorado Springs Season Opener (Jan 31-Feb3). Connect with LEG on Facebook for fun contests and prize giveaways, the latest news, photos, and more! Bucas: We pride ourselves in creating a collection of technical horse rugs and blankets to ensure that your horse is suitably dressed no matter what the weather.